Venezuela has demanded an explanation from Washington after a US military aircraft violated its airspace. The US ambassador in Venezuela's capital, Caracas, has been summoned to explain Saturday's event. US officials said a naval plane on a counter-narcotics mission had "navigational problems" that led it to briefly enter Venezuelan airspace. Tension has been rising in the region with both the US and Colombia accusing Caracas of financing Colombian rebels. Venezuelan Defence Minister Gustavo Rangel said the US jet had been tracked by his country's air defences over the Venezuelan-owned island of La Orchila on Saturday. Mr Rangel told a news conference that the US aircraft "practically flew over" La Orchila - where Venezuela has a military base and President Hugo Chavez has a residence - and another island before turning back. "This is just the latest step in a series of provocations," he said. US officials admitted the incident later on Monday. "Support of Venezuelan air traffic control was greatly appreciated as they rendered assistance in guiding the US aircraft to international airspace," the US Joint Interagency Task Force South said in a statement. "A US S-3 aircraft conducting counter-drugs operations lost navigational situational awareness causing it to fly into Venezuelan airspace off the mainland coast," the statement added. The Florida-based task force conducts counter-narcotics operations in the Caribbean. 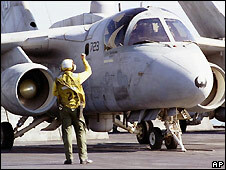 The S-3 is a reconnaissance aircraft. The BBC's James Ingham in Caracas says it comes at a time of increased tension in the region, with both the US and Colombia accusing Venezuela of financing the left-wing Revolutionary Armed Forces of Colombia (Farc). Colombia says various documents prove that Venezuela has funded the rebels. Mr Chavez insists he has never provided any support. The US violation of Venezuelan airspace comes two days after a similar claim was made against Colombia. The Bogota government denied that its troops had crossed into Venezuelan territory on Friday. Our correspondent says the latest row will further increase tension between Venezuela and two countries it clearly sees as threats.